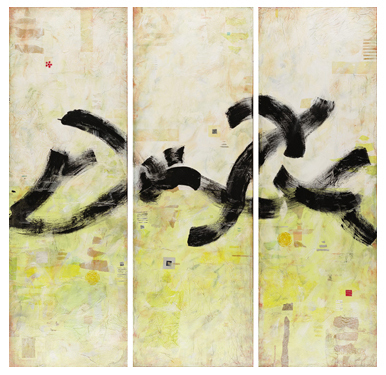 Anne Simernitski is a French native abstract expressionist painter with Asian influences, who uses a unique combination of rice and silk paper combine with acrylic and metallic paint. The paintings are created by soaking, gluing, layering, peeling, and rubbing these materials together. Anne Simernitski studied at the Louvre Museum School, Paris, France and later moved on to the Sorbonne Nouvelle University where she earned her BA in History of Art. She moved to the US in 2000 and is currently working as a full time artist in her Kirkland studio. Anne Simernitski has been part of numerous group exhibitions which produced favorable regional press. She also has a number of private collectors throughout the Northwest, France and Singapore. 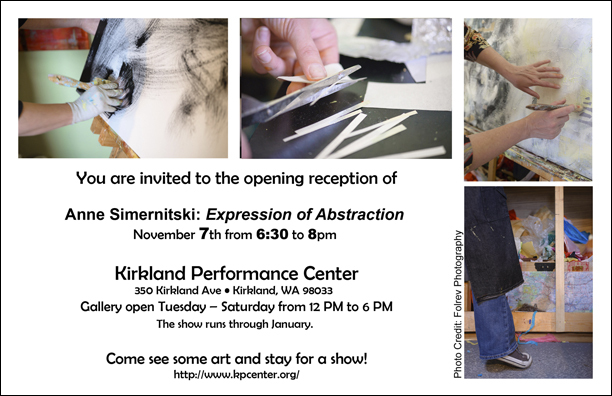 In partnership with the Kirkland Arts Center.